I don't consider myself an expert on business or tea. But if I were looking to get into the tea business nowadays I think I would specialize in one small niche. For my money, it seems that there are too many tea merchants out there trying to do it all. I wrote about a few of these niche companies previously. There's Kyela Teas, which focuses on Darjeeling and O-Cha.com, which narrows its focus to Japanese green teas. Here's an interesting informational site about Pu-erh tea called Pu-erh, A Westerner's Quest. Oolong fans might want to try OolongOz.com, which is run by "a dedicated group of High Mountain Oolong Tea aficionados living in Australia." What got me thinking on this topic again was an email I received yesterday announcing that Matcha Source had opened their "doors" for business. 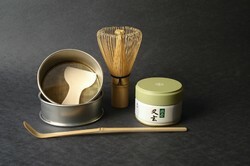 Matcha, of course, is a Japanese green that's probably best known as the tea used in Japanese tea ceremonies. Of course, nowadays it might be better known as a tea used in assorted and sundry Starbucks drinks.